Winter is here, which means it is time to toss out your fall wreaths and replace them with winter wreaths. When you think of a winter wreath, you may imagine a wreath made from pine boughs. However, there are many other creative ways to make a winter wreath. From a wreath made from pine cones to a wreath made from yarn balls, these winter wreath ideas are unique and simple. Today, I'm going to go over different winter wreath ideas that you may be interested in making. Making your own winter wreath is much cheaper than buying one, and it is such a fun experience. This first wreath is very easy to make. It only requires a wreath frame, pine cones, and any other decorations you'd like to add to the wreath. You can use whatever kind of wreath frame you want. A wireframe is easy to work with because all you have to do is wrap some wire around the pine cones and twist them onto the frame. Once you choose what kind of wreath frame you want to use, start attaching the pine cones. 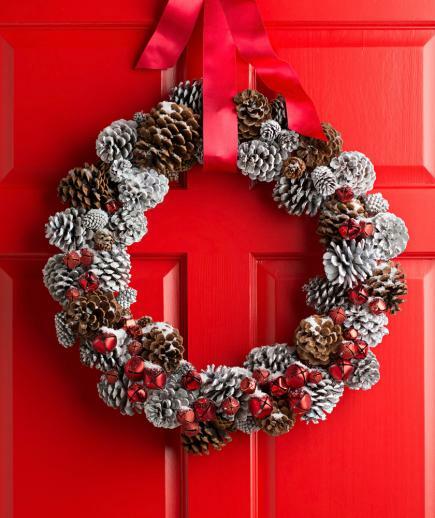 If you are using a foam wreath, you'll need to glue the pine cones on. After all the pine cones are on, attach some ribbon on the back by gluing or tying it on. This will be the hook for hanging it on your front door. Add any other decorations that you want, such as bells, flowers, or fake cranberries. This next winter wreath is another easy craft to make. It doesn't require any fancy sewing, tucking, gluing, or pinning. The hardest part is cutting out all the squares, but cutting them doesn't take too long. As for attaching the garland onto the wreath frame, that only takes a couple of minutes. Gather lots of felt and cut out hundreds of approximately 2-inch squares. Use white dental floss and a needle to string the squares together. Once you do this, your garland is made. Now it is time to attach it to the wreath frame. Lay the garland around your wreath frame. If you want, you can tie a ribbon around your wreath frame. Start adding some wire in the middle of the garland. Use your floral craft wire to secure the dental floss to the ring at a few points. Secure it in enough places that your wreath will stay round-shaped. Tie and trim the ends of the wire once you are all done tying it to the frame. If you want to add a bell, attach it onto the wreath frame using wire. Most wreaths have a round-shape, but what makes this wreath unique is its square-shape. It is possible to purchase a square wreath frame, but you can easily create your own wreath by using a picture frame. If you want, you can paint the picture frame a certain color, but in the instructions below you will simply wrap fabric around the frame. This saves you time from having to paint the frame and wait for the paint to dry. Start by wrapping the fabric around the frame. Glue the ends onto the frame. Once the fabric is attached to the frame, begin adding the flowers and twigs. You can glue them on, or you can simply slide them into the fabric strips. Attach a ribbon to the back of the wreath using glue. 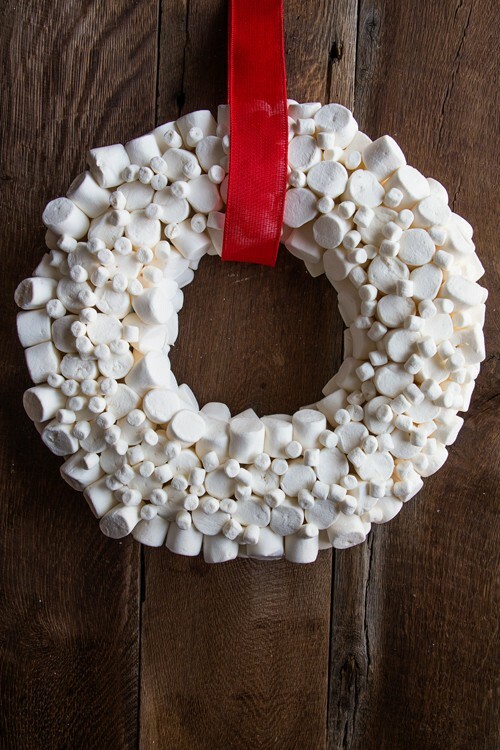 A marshmallow wreath is not something that you see every day. This wreath is unique, simple, and super easy to make. It only requires a few supplies, with one of those being a bag of marshmallows. This is definitely the sweetest winter wreath you'll ever see! Insert the toothpicks about halfway into the foam wreath form. Add a regular marshmallow to each toothpick. Fill in the entire wreath except for the back. Add the mini marshmallows to fill in the gaps between the regular marshmallows. Place the wreath in a cool place such as a refrigerator for about 24 hours to let the wreath set up. Glue the ribbon onto the back of the wreath. If desired, attach lightweight ornaments to the wreath using a hot glue gun. 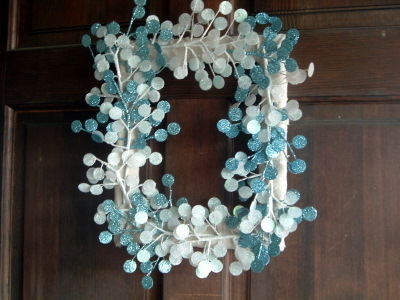 If you keep your marshmallow winter wreath in a cool place, it may last for a long time. The last thing you would probably think of being on a wreath is balls of yarn. But surprisingly, yarn balls are very pretty looking when attached to a wreath. This wreath is very easy and quick to make. Because it is made with neutral colors, this winter wreath can be kept up through the whole winter and not just for Christmas. Start by wrapping the yarn around the Styrofoam balls. Make as many yarn balls as you think you'll need for your wreath. Wrap your wreath frame with burlap. Using hot glue, attach the yarn balls onto the wreath. Glue on any other decorations you'd like on the wreath. Such decorations could be Christmas ornaments. When you are all finished, attach ribbon or yarn to the back for hanging the wreath. 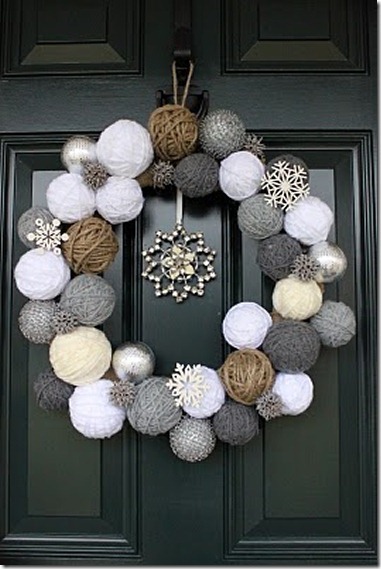 Wanting a winter wreath that is going to stand out? Try making this wreath. It uses bottle brush trees to make it look like a forest on your door. With the miniature ice-skating figurines and the forest of trees, this wreath looks creative and unique. Begin by cutting the fabric strips. Cut the fabric into several 2 1/2-inch-wide strips. Dab glue onto the back of the wreath and secure the edge of the fabric to the foam. Begin wrapping the fabric strips around the wreath. Repeat, securing with glue periodically, until the wreath is completely covered by fabric. Remove the bases of the bottle brush trees and bushes so that the wire is exposed. Insert the wire into the wreath and bend the wire so that the tree is flat against the wreath. Add some glue if it needs to be secured. Continue adding the bottle brush trees on both sides of the winter wreath. Cut an 18-inch piece of ribbon and lace it through the trees so that it's loosely draped across the bottom of the wreath. Glue the ribbon into place. Using a small amount of glue, secure each of the miniature figurines onto the ribbon. The most popular winter wreath is the kind that is made from fresh pine boughs. If you don't have fresh pine boughs, you can make this wreath using fake pine greenery. 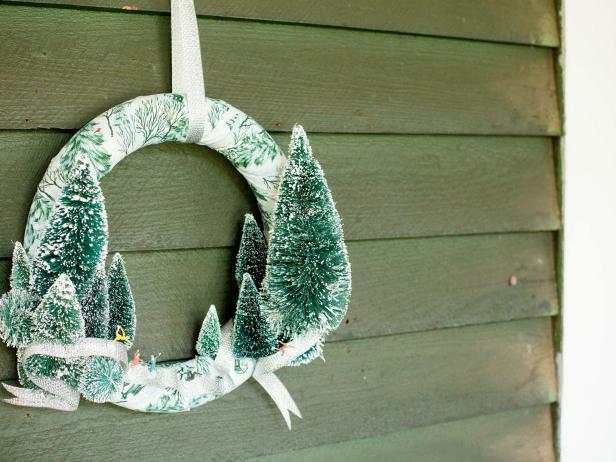 However, if you do have access to fresh pine boughs, try using them to make this winter wreath. Take a few different boughs of greenery and bunch them together at the base of the branch. Take the bundle, and place it against the wreath form. Wrap the floral wire around the boughs and wreath form. Continue this process, laying each bundle over the previous bundle. Decorate your winter wreath in any way that you desire. You could add pine cones, Christmas ornaments, or a bow. To attach these decorations onto the wreath, wrap them with wire and then twist the wire onto the wreath. The last step is to hang the wreath. You can either string some ribbon in the back of the wreath, or you can use a wreath hanger. Hang up your wreath and enjoy! Making a winter wreath for your front door is very easy to do. 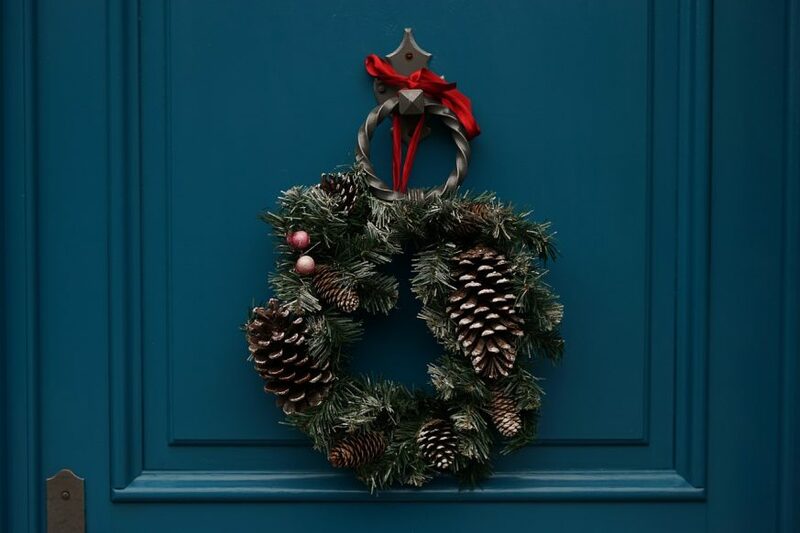 Today, I went over seven easy winter wreath ideas that will brighten up your door this season. As you can see, there are so many creative options when it comes to making an easy DIY winter wreath. You can make a traditional winter wreath made from pine boughs. Or, if you want to be a little more creative, you can use yarn balls, pine cones, and even marshmallows. 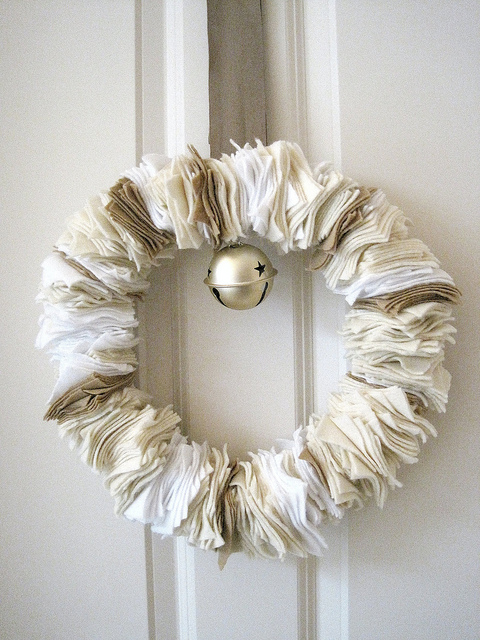 A lot of these winter door wreaths can still be used long after Christmas. 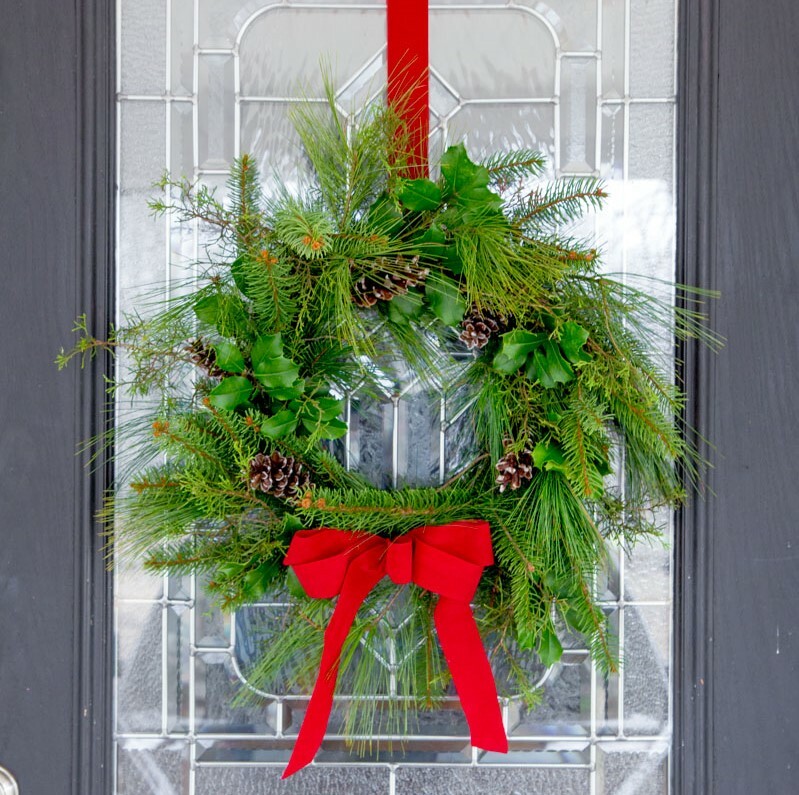 Remember that you can make adjustments to these winter door wreaths. If you want it to be a Christmas wreath, add some ornaments or artificial cranberries. Or if you want it to be used after Christmas, consider using neutral colors and decorations that aren't made for holidays only. Most importantly, remember to have fun when making these winter wreaths. Making a winter wreath can be a fun craft to do on a cold winter night. For an ultimate guide on how to hang your Christmas garland along with your winter wreath, click here. Happy crafting!